The 2017 Preble County Sheriff’s Office Employees of the Year for 2017 included: Dep. Shane Hatfield Road Patrol/Investigations; Disp. Amber Taylor, 9-1-1 Communications; Kerrie Beachler, LPN Support Staff; Sgt. Jenifer Petitt Supervisor; Derek Taylor Corrections and Dep. Randy Tunnell, Special Deputy. EATON — Preble County Sheriff Mike Simpson recently announced Employee of the Year awards for 2017 were presented to staff at the PCSO annual meeting in January. One employee from each division is recognized for their efforts each year. Employees are chosen based on several criteria, including professionalism, work ethic, team work, and overall performance. The 2017 employees included: Dep. Shane Hatfield Road Patrol/Investigations; Disp. Amber Taylor, 9-1-1 Communications; Kerrie Beachler, LPN Support Staff; Sgt. Jenifer Petitt Supervisor; Derek Taylor Corrections; Dep. Randy Tunnell, Special Deputy. 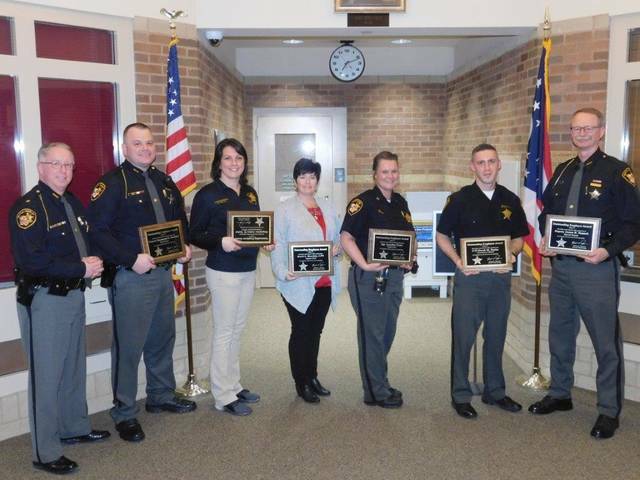 https://www.registerherald.com/wp-content/uploads/sites/41/2018/03/web1_PCSO-EOY.jpgThe 2017 Preble County Sheriff’s Office Employees of the Year for 2017 included: Dep. Shane Hatfield Road Patrol/Investigations; Disp. Amber Taylor, 9-1-1 Communications; Kerrie Beachler, LPN Support Staff; Sgt. Jenifer Petitt Supervisor; Derek Taylor Corrections and Dep. Randy Tunnell, Special Deputy.